Once upon a time my high school sweetheart and I were looking to rent a film. She was a horror fan and recently enamored of the Amityville Horror remake starring Ryan Reynolds. Failing to find the film (or a suitable Ryan Reynolds travesty), we settled on the 1979 original on sale at Ralphs for $5. As amorous couples often do, we were soon ignoring the late ‘70s spook classic in favor of an epic makeout session. And there was much rejoicing. I did eventually make it through the second half of this codswallop, this jabberwocky, this skimble-skamble, this applesauce, this bushwa, this twaddle, slipslop, whang-doodle, drab, drudging, boring not-scary waste-of-$5 movie. If I were to tell you that the tragedy of the DeFeo massacre would be shamelessly exploited by this Exorcist ripoff and star Josh Brolin’s father doing his best not-Jack-Nicholson impersonation one year before The Shining film but two years after The Shining book and feature a room of blood, Margot Kidder in nothing but her underwear, flies attacking Catholic priests, and a mad man on a motorcycle, I bet you’d be at least a little bit curious to check that film out. Well don’t. Cause it’s bosh, and seven shades of horse apples. This film is so irritatingly boring that while I was watching it I was able to do my dishes, change my sheets, reorganize my bookcases, catch up on email, and settle down in Long Island with a nice lady and her three children. They still call me George, though. What makes a film scary I’ve detailed before on this website but I’ll take a breath to restate that it takes atmosphere and immersion, sympathy for our protagonists and a sense of foreboding. Granted, there’s that scene with Kidder in her underwear and I’m certainly sympathetic to that. But Amityville falls victim to the same pitfall that The Shining did in making its main dude come off as a psycho too soon. But even I’ll hand it to Kubrick and say there was much more going for that film than this boondoggling doggerel. 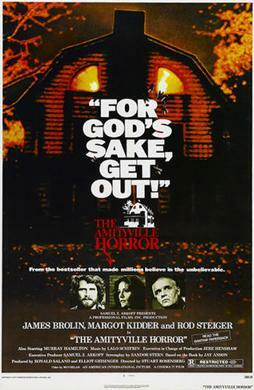 Simply put, there’s nothing happening in The Amityville Horror. Yes, we hear the wind blow, we see a chair rock, the ominous voice says, “Get out,” and Mr. Lutz (James Brolin) feels cold and has an obsession with chopping wood. I suppose the issue here is that the film tried to be too truthful to the “real life” events. Would you like to know what this film’s climax is? If not, please skip this paragraph, I’d hate to spoil it for you. The climax of this film is the family runs away in the car, they forget the dog. The father goes back for the dog, the stairs to the basement break, he falls into a pool of blood. The dog pulls him out, he picks up the dog, the family drives away. That’s your big payoff moment, folks. I realize what I’m about to say is unfair as these films came later and perhaps if Amityville did not exist neither would they, but if you took the most interesting seeds from this film you might end up with 1980’s The Shining and 1982’s Poltergeist. Between those two films and 1973’s The Exorcist you have a trio of horror cinema that will stand the test of time. Again, it’s bad form to rip on a lesser film in favor of its successors but my job as a critic is to not only steer you away from the bad apples but to hopefully point you in the direction of the tasty ones. Personally, George Lutz comes off as a man battling alcohol and steadily losing control of his life. After marrying a pretty lady with three kids and no discernible job and buying a house he can’t pay for he gets drawn in to the occult spookiness of his new digs and alienates his best friend and sends his business into a death spiral. The whole film is a metaphor for buyer’s remorse. And in fact it’s a meta-metaphor because not only is that what’s really going on, you’re really climbing out of your seat to find out if you can get a refund on your ticket. It’s eight years too late for me to return this movie to the grocery store but it’s not too late for you. And *****, honey, if you’re reading this, we made the right move. Thanks for the kisses.